Custom Labels for Visitors, Field Trips, etc. In the same vain of Preprinted Temporary ID labels, TempIDs.com also offers custom labels to use for Visitor Passes, Field Trips, Volunteers, Substitute, Parents, Bus Passes, and Chaperones as well as reminder stickers for students to wear home so parents don't forget about the upcoming PTA, PTO, or Parents' Club meeting, Early Dismissal, Special Spirit Day Dress, or to recognize students' birthdays or special achievement that day. We also have visitor label books with carbon copy for schools. Our standard school label size is 2.5" x 3". The pricing below is for one color label with one color ink. We have 10 standard ink colors to choose from: black, yellow, red, orange, reflex blue, process blue, purple, burgundy, brown, and green. The label colors: yellow, white, red, silver, and the following fluorescents: pink, chartreuse, green, orange, and red. If you would like to have the same artwork on different color labels, then we can do that for a Label Color Change Charge of $10.00 per label with a minimum of 5,000 labels ordered. Say you wanted to get 5,000 labels with the same art, but have it on five different color labels. We can do that and you would get the lower 5,000 label price. Even with the $10.00 per label color charge, the price is cheaper than ordering 1,000 labels five times. Having printed Visitor Passes help you know who is in the building and to designate them properly as a Visitor, Volunteer, Substitute, Chaperone, or Parent. We have hundreds of mascots to choose from or you can email us yours. We can feature your mascot prominently or as a watermark as shown on thesamples that appear on this page -- custom labels for schools. Simple designs come with complimentary layout. Most have the school name, Visitor, Destination, Date, and Time printed on the label. Schools typically place a reminder in the folder about upcoming events whether it is a special dress day, early dismissal, parent meeting, or to bring an item for a special event. As a parent of young school aged children I can tell you that there were times that I have forgotten to look in that special folder or sometimes the reminder fell out of the folder. Which meant for early morning audibles of running to the store before school for that special item, changing clothes at the last second and missing the school bus, or arriving late or missing the parents' club meeting entirely. Using TempIDs.com reminder stickers reinforces the message by placing the sticker on the students' clothes so that the parent sees the message and encourages a higher compliance rate with your event or message at an inexpensive cost. We print the reminder sticker according to your specifications and we can email you or snail mail you a proof. For those that need lower quantities, for your consideration we have custom preprinted temporary ID rolls are 2.25" x 4" and available in white, yellow, blue, green, orange, pink, light purple, and red and come 300 to a roll. 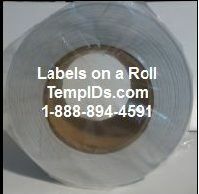 Tempids.com's smaller label rolls are better because most offer the larger label rolls which means you buy labels that will more than likely go unused. 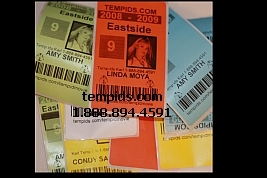 Let tempids.com assist you with enhancing security at your corporate office or school with visitor temporary ID badge system. Know who belongs and who doesn't at your school to keep it safe.